Denver criminal defense attorney Harvey Steinberg does it again. 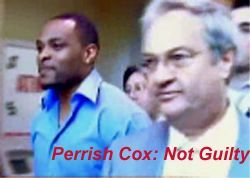 The Douglas County jury has found former Denver Bronco Perrish Cox not guilty of sexual assault charges. Background here. Congrats, Harvey! Outside the courtroom, Cox expressed appreciation for his attorney, Harvey Steinberg, and others who supported him during the trial. "I love my lawyer and everybody else who's been," with me." Update: #PerrishCox and "Harvey" are now trending on Twitter in Denver. Update: The jury has retired for the evening without a verdict and will resume deliberations tomorrow. Update: Review of closing arguments here. A reporter takes this photo around 3:30 pm of a worried Cox in the cafeteria waiting on the verdict. Closing arguments are underway in the sexual assault trial of former Denver Cornerback Perrish Cox. Affidavits for arrest warrants are not evidence. Their contents may be correct, but they also may contain inaccuracies. Affidavits contain hearsay, speculation and assumptions. They are not subject to the rules of evidence. They are not tested by cross-examination. Their purpose is merely to convince a judge that probable cause exists to arrest someone for a crime. Criminal trials take place in public. Criminal investigations should not. One sided affidavits have no place in the public domain unless and until they are admitted as evidence at trial.